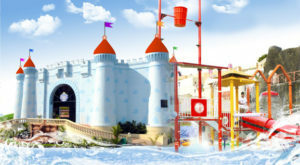 Sadhoo Merry Kingdom is a water theme park located in Chala in Kannur district. It was established in the year 2007 and is a favorite place of many tourists. There are several rides that entertain people of all ages. There are 25 rides in this park which includes both water and dry rides. Some of the facilities provided here are restaurants, shops, video games etc. The filtration technique used here is most modern and ensures purity. Some of the rides available here include family pool, hill slide train, Jet slide, Kids pool, Multi slide, Columbus, Thunder river, Jumping frog, Butterfly, Dashing car, Giant dinosaur, Giant Dragon etc.